● Using our XQD card reader or USB adapter which ensures the best compatiblity with Sony's XQD cards, dramatically reduces data backup time for more efficient workflow. 【Designed for Photographers】- Our XQD USB 3.0 Card Reader is professional-level and portable USB 3.0 card reader, easily allows you to transfer large quantities of 4K videos and RAW images from our XQD card reader to your laptops/computers through USB 3.0 interface in just seconds, greatly improve your workflow and getting you back to camera asap. 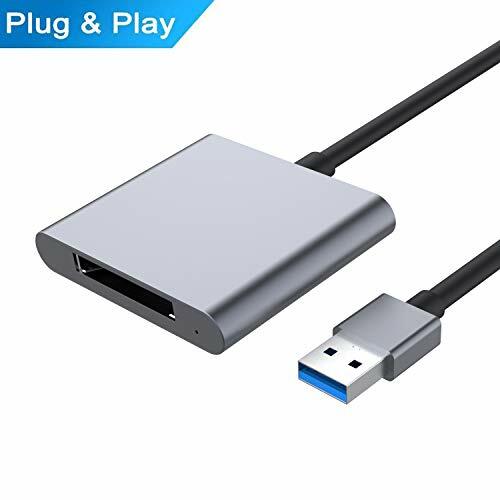 【USB3.0 Super Speed】USB3.0 port design, accelerate working efficiency, super speed USB 3.0 interface, 10x faster than USB 2.0, max card capacity can reach 2TB. 【Wide Compatibility】- This XQD card reader is designed for XQD 2.0 cards, compatible with All of Windows/Mac OS systems, a great choice for sony G series, Lexar USB Mark card. 【Compact & Ultra Design】- Portable and compact, suitable for any occasion. It's made by high quality aluminum alloy shell, durable and fashionable, scratch-resistant. Easy to set up, plug&play. No driver needed. Hot swapping and auto detection. 【NOTE & Services】- This adapter only support transfer photos and videos. If you have any issue with your product, Please contact us and our team will respond to you within 24 hours.